To start a meal with a salad at chef Ed Kenney’s Town restaurant on Oahu is no mundane graze before the good stuff arrives. The arugula is earthy, perfectly peppery. The cilantro pops. The citrus is bold. Food tastes more intense—better—in Hawaii, and it’s not because the warm breeze on your bare arms is making you island-drunk. It’s the sun, and the rich, dark soil at places like Ma‘o Organic Farms, where Kenney gets his greens. And although 85 to 90 percent of Hawaii’s food is still imported—the Islands have a long and complicated agricultural history—the grassroots movement to grow more food locally has reached a tipping point. Even a few years ago, choice beyond tropical fruit was limited, Kenney notes. “Now, we have purslane, carrots, heirloom beans. Farmers’ markets with one row of stalls now have four.” Ranchers, cheesemakers, and mushroom growers are adding more fresh options, beyond veggies, helping to inspire a new era of Hawaii cuisine. Go taste for yourself. Big Island | CanoeHouse at the Mauna Lani Bay Hotel, Kohala Coast. This kitchen has launched the careers of many Hawaii regional-cuisine chefs (Alan Wong, for one). The heaping bowl of Kona-raised clams with Hilo corn, piquillo peppers, and the hottest Big Island ingredient—fiddlehead ferns from the lush, forested Waipi‘o Valley—is a study in sweet-savory balance. The restaurant excels in seafood, like deep-caught ahi and Kona-farmed shrimp. $$$$; 68-1400 Mauna Lani Dr.; 808/881-7911. Kauai | Gaylord’s at Kilohana, Lihue. Set on an old plantation, this may be the most romantic place to eat on Kauai. The food leans to traditional (mahimahi with mashed potatoes), but some dishes show more flavor range, such as sesame-seed seared ahi with ginger scallion sushi rice and lomilomi tomatoes. $$$; 3-2087 Kaumuali‘i Hwy. ; 808/245-9593. Maui | Market Fresh Bistro, Makawao. At this small restaurant in a historic cowboy town, chef Justin Pardo goes hyper-local: His Upcountry vegetable salad is grown on this side of Maui. It’s all good here, but the taro-crusted amberjack in a tomato-saffron broth with roasted rainbow carrots is unlike anything you can get on the Mainland. $$$$; closed Mon; 3620 Baldwin Ave.; 808/572-4877. Maui | The Plantation House, Kapalua. The open-air dining room and sweeping views alone would be worth the trip. 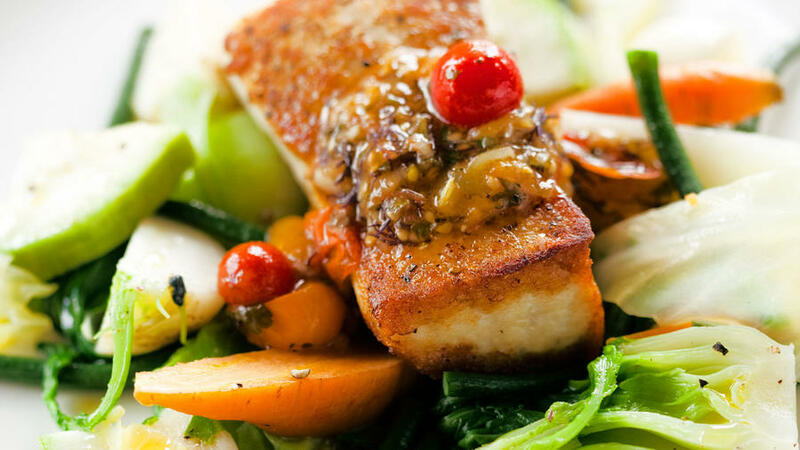 But chef Alex Stanislaw has been doing locavore cuisine here since 1992, long before it was cool, and his devotion shows in dishes like A Taste of Maui: pistachio-crusted fresh fish on Maui onions, Kula tomatoes, Upcountry spinach, and Mediterranean couscous. $$$$; 2000 Plantation Club Dr.; 808/669-6299. Oahu | Town, Kaimuki. Chef Ed Kenney is Oahu’s farm-to-table man of the moment: First Lady Obama tapped him for organic-food luncheons, talks, and tours last time she visited. Town turns out modern-rustic dishes like hand-cut pasta with Hawaii octopus, fennel, tomato, and herbs. Look for snout-to-tail specials—Kenney buys and butchers a pig each week—as well as the no-canned-juice-here Ernesto cocktail of Hawaiian rum, lime, grapefruit, and rosemary. $$$; closed Sun; 3435 Wai‘alae Ave.; 808/735-5900. Big Island | Eddie Aikau Restaurant, Waikoloa. It might have been the surf-culture motif that got you in the door, but you’ll want to eat here too, for impressive dishes like the Big Island grass-fed filet mignon with gorgonzola, shiitake wonton, balsamic demi-glace, fingerling potatoes, and island stir-fry. $$$; 69-250 Waikoloa Beach Dr.; 808/886-8433. Big Island | Village Burger, Waimea. These aren’t just burgers. They’re grass-fed Big Island beef on Holy’s Bakery rolls (from the town of Kapa‘au), with accoutrements such as island goat cheese and tomato marmalade. Wash one down with a strawberry shake made with local dairy and fruit. $; Parker Ranch Center, 67-1185 Mamalahoa Hwy. ; 808/885-7319. Maui | Flatbread Company, Pa‘ia. One section of this massive pizza place is dominated by an earthen wood-fired oven from which perfectly composed Maui-centric pies emerge, adorned with organic rosemary, Maui pineapple, Ha‘iku tomatoes, and more. The Mopsy’s Kalua Pork strikes a balance of smoky, sweet, herbaceous, crunchy, and creamy. $$; 89 Hana Hwy. ; 808/579-8989. Maui | MauiGrown Coffee Company Store, Lahaina. Taste the fruits of grower Kimo Falconer’s labors at this old mill office turned coffee shop. Maui Mokka, their rarest and best blend, has a medium roast with lingering chocolate notes. It’s rich, smooth, and totally Maui. Closed Sun; 277 Lahainaluna Rd. ; 808/661-2728. Oahu | Ola at Turtle Bay Resort, Kahuku. The North Shore has ono (“good” or “delicious”) shrimp trucks and shave-ice joints, but few options for a decent sit-down meal. Ola is a good choice because of its beachside open-air seating—the perfect setting to enjoy the ahi poke spiked with briny, crunchy sea asparagus, or the umami-rich orzo with mushrooms from the Hamakua Coast. $$$; 57-091 Kamehameha Hwy. ; 808/293-0801. Oahu | OnoPops, at farmers’ markets and Whole Foods. These haute popsicles, developed by brothers Joe Welch and Josh Lanthier-Welch, come in flavors reminiscent of their Oahu childhood, as well as tastes of the moment: Liliko‘i Cheesecake, Salted Watermelon, Rangpur Mojito (with Kona limes, Maui rum, raw cane, and North Shore mint), and Pineapple Li Hing (with OnoPop’s own li hing sweet-salty spice blend). A new flavor is added just about every week. The day we discovered the pops, we ate four. Oahu | Sweet Home Waima­nalo, Waimanalo. The mixed greens in your FarmRoof Super Salad, with raw-coconut vinegar and macadamia-nut oil dressing, come from the organic rooftop garden at this cafe housed in an old gas station. The hibiscus-mint lemonade is aromatic and re- freshing, and don’t be afraid of the kale smoothie; it has pineapple, banana, and honey to temper the über-wholesomeness. $; 41-1025 Kalaniana‘ole Hwy. ; 808/259-5737. Big Island | Holuakoa Café, Holualoa. Up the hill from Kailua-Kona, a 4-mile drive from where tourists typically venture, Holuakoa’s open-air garden dining area is an oasis of rich flavors, like the homemade potato gnocchi with Hamakua mushrooms, Hawaiian pumpkin, and summer squash served with sherry cream and parmesan. $$$; closed Mon; 76-5900 Old Government Rd. ; 808/322-2233. Kauai | Kauai Family Cafe, Wailua. Travelers often speed right by on the way to the North Shore, not knowing that this retail strip spot is home to the island’s best Filipino food. Specials change, but the best are grilled pork with onions, and the pinakbet: a Filipino dish dense with local bitter melon, okra, eggplant, and string beans. $; closed Sun; 4-361 Kuhio Hwy. ; 808/822-3288. Maui | Like Poke?, Kahului. Just five minutes from the airport, in a warehouse parking lot where tourists would never go, is some of the island’s best poke. Danny Kalahiki mixes it to order in his vintage-style quilted-steel lunch wagon. Must-have: the ahi shoyu wasabi poke. The marinade is a perfect balance of salty, sweet, spicy, and umami. Locals eat lunch early, so it’s best to get there around 11. $; 140 Hobron Ave. (in the parking lot at Kahului Trucking & Storage, near Pier 1); 808/757-2239. Oahu | He‘eia Kea Pier General Store & Deli, Kane‘ohe. This $8.50 lunch at a fish pier just might be the best thing you’ve ever eaten off of a paper plate. Chef Mark “Gooch” Noguchi, who has worked at Chef Mavro (arguably the finest restaurant on Oahu) as well as Town, prepares mouthwatering locally sourced plate-lunch dishes like guava chicken and adobo pork, as well as Kuahiwi Ranch beef burgers and an occasional fish of the day. Order at the cash register, pick up at the window, and … mmm. $; closed Mon; 46-449 Kamehameha Hwy. ; 808/235-2192. Big Island | Monstera, Kohala Coast. This place does traditional Asian cuisine spot-on, and has a cult following for its heavenly bonito broth udon, rich with tempura vegetables and shrimp. The local snapper may have been caught within eyeshot of your table. $$$; 68-1330 Mauna Lani Dr.; 808/887-2711. Kauai | Hukilau Lanai, Kapa‘a. There are a half-dozen catches of the day here, all from Kauai fisher­men, but for a creative twist on the traditional, try the signature ahi poke nachos, cubes of fish atop crisp wonton chips with diced tomatoes, avocado, fish roe, and a spicy wasabi cream sauce. Bonus: open-air dining with an ocean view. $$$; closed Mon; 520 Aleka Loop; 808/822-0600. Maui | Paia Fish Market, Pa‘ia. First, pick your fish: fresh opah, ono, ahi, opakapaka, or mahimahi. Then your preparation: charbroiled, sautéed, blackened. Finally, your sides: Cajun rice, home-fried potatoes, hand-cut slaw. And be quick about it—there’s a crowd behind you. The communal table is packed with European windsurfers, tourists en route to Hana, and hippie expats from the Mainland. Not your scene? You can always get it to go for a picnic on the beach. $$; 100 Hana Hwy. ; 808/579-8030. Oahu | Uncle’s Fish Market & Grill, Honolulu. Why put a tiki-motif seafood restaurant in an industrial neighborhood? Because it’s less than a minute’s walk to the Honolulu Fish Auction, where Uncle’s gets its ahi, opah, mahimahi, and whatever else is fresh, six days a week. The best part is what they don’t do: oversauce or overcook. Here, the fish is the star. $$$; 1135 N. Nimitz Hwy. ; 808/275-0063. Kauai | Living Foods Market and Cafe, Koloa. The staples are here (house-baked bread, wine, European cheeses), as is a deep selection of island fish, fruits, and vegetables. The smoothies are chock-full of coconut, papaya, and other seasonal Kauai fruits. $$; 2829 Ala Kalanikaumaka; 808/742-2323. Kauai | Waipa Farmer’s Market, Hanalei. The island’s oldest farmers’ market is held, get this, on a farm, in a lush valley bound by blue-green mountains and the sea. Spring means flower power: heliconias and red and pink gingers. You can sample your way down a line of fruits like longan, rambutan, and rosy-fleshed Sunrise papaya. And don’t miss the chocolate-dipped apple bananas, made from the sweet-tart mini banana variety. 2–4 Tue; 5-5785 Kuhio Hwy. ; 808/826-9969. Maui | Rodeo General Store, Makawao. This upscale but authentic grocery/deli is loaded with produce from Ono Organic Farms, house-baked breads, and prepared deli salads. Don’t leave without a cup of steaming chili made with Maui Cattle Company beef. $; 3661 Baldwin Ave.; 808/572-1868. New second location: 1847 S. Kihei Rd., Kihei; 808/633-4990.